The last few years a term of art has been floating around the Mac community. You may have heard it. "The Delicious Generation" This phrase comes from a specific application called Delicious Library that released a few years ago and made a lot of people rethink Apple software design. Well recently the folks at Delicious Monster released Delicious Library 2 and it certainly lives up to the high standards set by its predecessor. So what is this precedent setting software you ask? In essence, it is a home inventory system for your books, CD's, video games, electronics, tools, toys, and other things precious. I know that doesn't sound all that exciting but that is what makes Delicious Library 2 so impressive. It does home inventory with panache'. So let me walk you through it. Loading up Delicious Library 2 there is a little scanning button. With a click , Delicious activates your iSight camera. You can then take your toys (such as a DVD) and hold the UPC code up to your iSight camera. You hear a satisfying "beep" and then Delicious goes and fetches your title from the internet. It reads the name of your DVD and literally pours the contents on a virtual wooden shelf showing a copy of your DVD. It just doesn't pull down an image and name though, Delicious grabs tons of metadata ranging from actors, dates, reviews, and even points you to other similar titles you may enjoy. That really is all there is to it. When I scanned in Star Wars it told me "I am your father." I sat my six year old at the Mac with a stack of DVD's taller than her and she had them all scanned into Delicious Library 2 in about 30 minutes. Child labor laws aside, getting your stuff in Delicious Library 2 is easy. It was no different loading up the video games and books. Before long, I had most of the family library recorded. You can purchase a separate bluetooth hand held scanner that would probably be a bit faster, but I found the iSight scanning to be very convenient. Not all of your stuff is going to have UPC codes however. For instance, some of my movies started out as DVD cases inside cardboard boxes with UPC codes on them. Well the cardboard boxes are long gone along with the UPC codes so I had nothing to show my iSight camera. Delicious Library has a text entry search that found all of them very quickly and added them into the library. It appears you can catalogue just about anything Amazon sells. 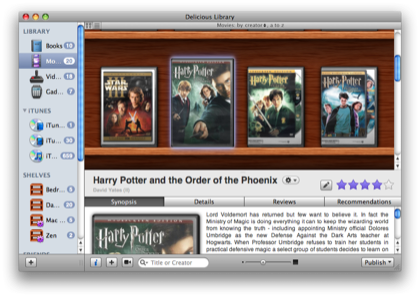 Likewise, Delicious Library will grab all of your iTunes library. That is not just the music. It also gets movies, TV programs, and audiobooks. My library currently only holds about 300 items without breaking a sweat. One of the changes made in Delicious Library 2 is the switch from XML to SQL which should make management of large libraries more efficient. So by now you are wondering why bother with an application like Delicious Library? There are several practical reasons including things like insurance records and personal inventories but I have to admit I am hooked because it is just fun. I've set up smart libraries with different genres of books. I've also got them categorized by where they are located which is excellent for someone like me who is easily befuddled. You can manually fill your shelves or use the "Smart Shelves" feature which allows you to set up specific criteria very similar to smart playlists in iTunes. Delicious also allows you to publish your library to the web or share it with friends. I am working on setting up a shared book library with several of my local friends so get our own informal library running. One of the export options is an iPhone or iPod optimized version so you can put it your library in your pocket. This could come in handy for trips to the bookstore if you have a large library. Another nice feature is you can drag a Delicious Library item on a contact in the OS X address book and it will add a note they they have borrowed an item and add an entry to your iCal. I really wish I had that when I loaned my Indiana Jones DVD collection out a few years ago. Delicious Library will also go onto the Interweb and figure out what all of your stuff is worth (in multiple currencies) and even, if configured, help you sell it through the Amazon store. You can get a free trial at Delicious Monster. A new license will cost you $40 and an upgrade from version one will cost $20. Delicious Library 2 is one of those applications that I feel in my bones could never exist on a windows box. Even if you are not interested in creating an electronic inventory, download the trial so you can see for yourself how software looks when it is done right.